The desert might seem like an odd place to visit when the temperatures have been in the triple digits for several weeks. 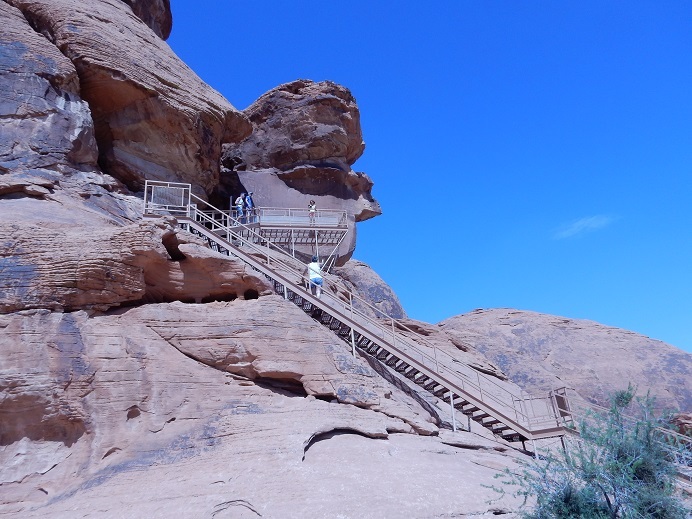 But, fortunately for us, there was a slight breeze and an air-conditioned van that eased any discomfort as we toured the Valley of Fire State Park in mid-July. 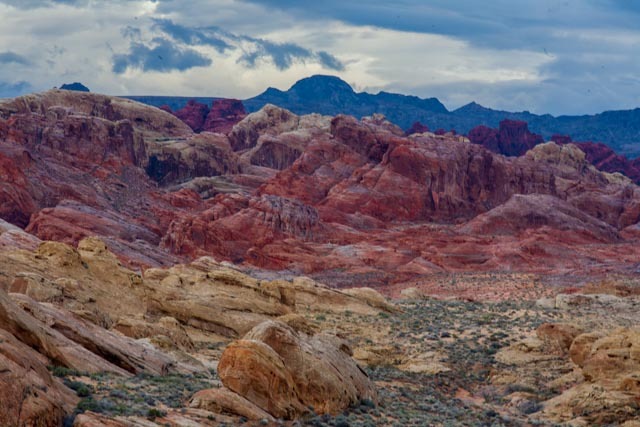 Valley of Fire is about 50 miles northeast of Las Vegas, Nevada. We scampered across rocks and climbed up into them. This place was on my must-see visit in Vegas this year. Some people stare at clouds and think they look like a dog, a bunny or some other creature. As we stared at the rock formations, we did the same. We saw the profile of an Indian Chief, an elephant, a poodle and much more. The desert also held some surprises. In the middle of nowhere, there were three cabins. 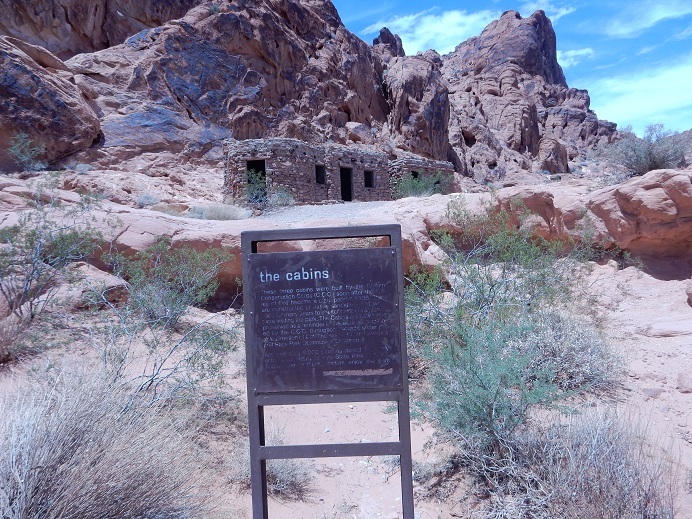 The Cabins were built by the Civilian Conservation Corps (CCC) workers in the 1930s. Not far from the park, we stopped to visit the Desert Springs. While it’s a lovely oasis, don’t drink the water and don’t swim in it. The results could be deadly. Profile of an Indian chief carved into the rocks? The Cabins built in the 1930s by the Civilian Conservation Corps (CCC) members. 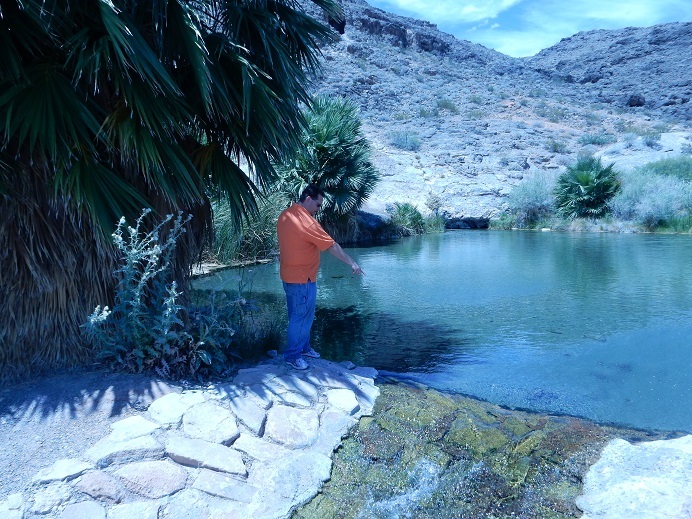 Our tour guide, Adam Hefner with Casino Travel and Tours, at Desert Springs – A welcome attraction in the dry desert, but do not drink the water or swim in it. Where do you prefer to visit? The mountains, deserts, rivers, the ocean or cities? Note about the photos: I chose to use five photos from Wikimedia commons because many of my own photos had a bluish cast. Not sure what happened. It was certainly disappointing when I checked the photos after we returned from our tour. 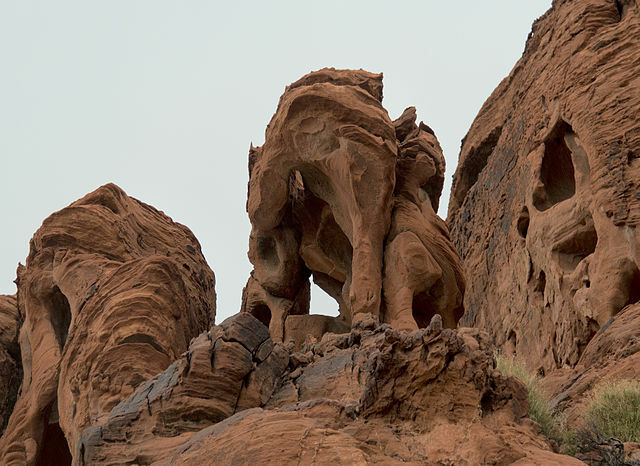 Photo: Valley of Fire – petroglyphs – Taken July 2015 by Judy Berman. Wow I can only imagine! What an amazing place! 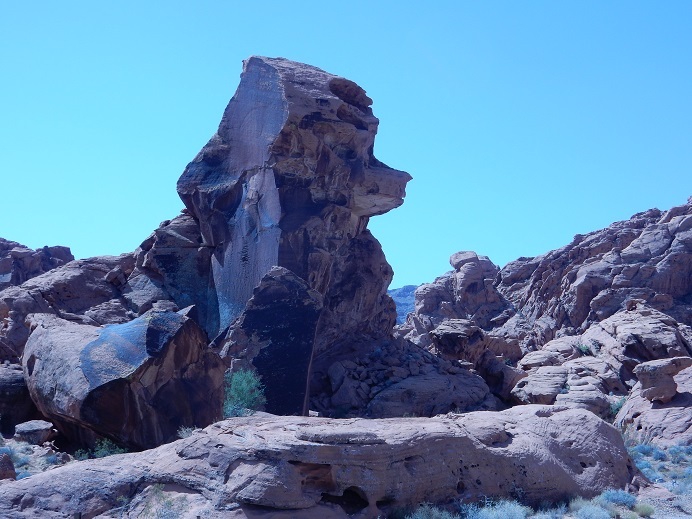 The rocks and formations are beautiful–otherworldly. My son and son-in-law took their eldest on a trip in July that included Las Vegas, Red Rock Canyon + Yosemite. The interplay of lights was gorgeous in the snapshots and video we viewed, particularly in the canyons. Our own trip to the Smokies was less ambitious but, (since you asked) I prefer mountain views to desert vistas. Why? Cooler temps and the mystery of tall peaks. It did not escape my notice that you invested a lot of time selecting and uploading photos and creating text for this post. I also know the disappointment of photos that are not quite up to snuff. Great post! Thanks for this bit of armchair travel, Judy. Thanks for noticing, Marian. 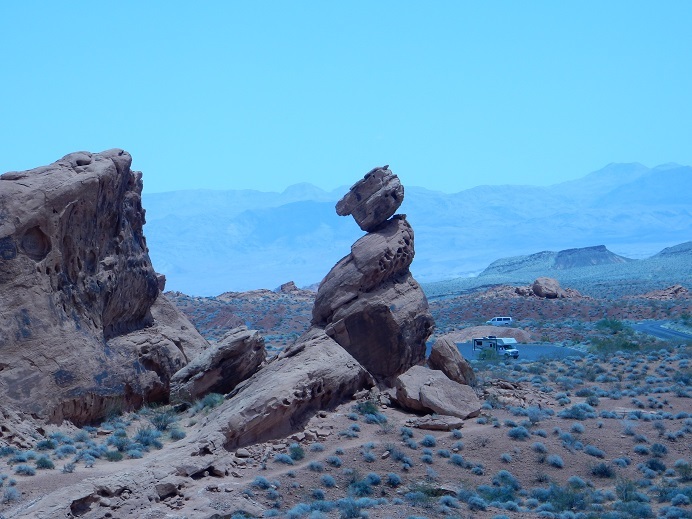 My own photos do not do the Valley of Fire justice. I’ll bet those photos your son and son-in-law took were gorgeous. Now I’ll need to schedule a trip there. You can easily adjust the bluish cast by setting the white balance in almost any photo editing program. Perhaps even the camera. I’ll try to check out your tip about adjusting the color. The photos have since been downloaded onto Picassa. What an amazing place! I just love the Indian Chief – and the colours of the rocks are incredible. Not sure I could cope with the heat though! 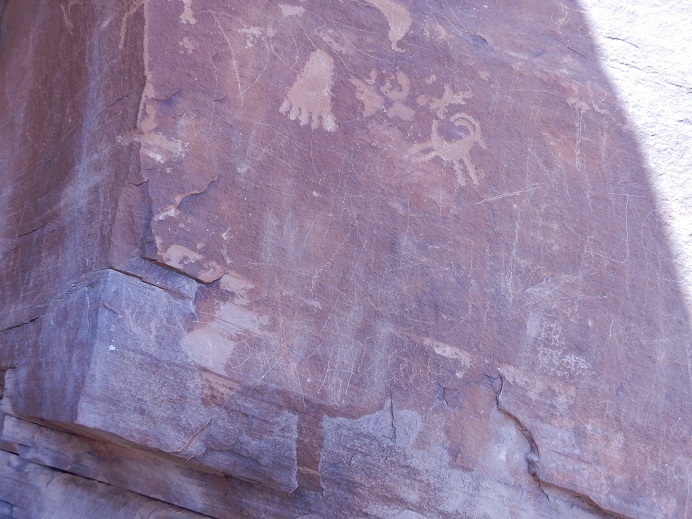 I really liked the petroglyphs and the valley of fire. I enjoyed photo of Lake at Desert Springs and thanks for the tour, Judy. 🙂 I never question why people go somewhere on vacation since everywhere you may fond natural wonders! The shore (as we call it near Jersey)! We were big Wildwood people too. wow, these are stunning landscapes. i love to visit all kinds of places. 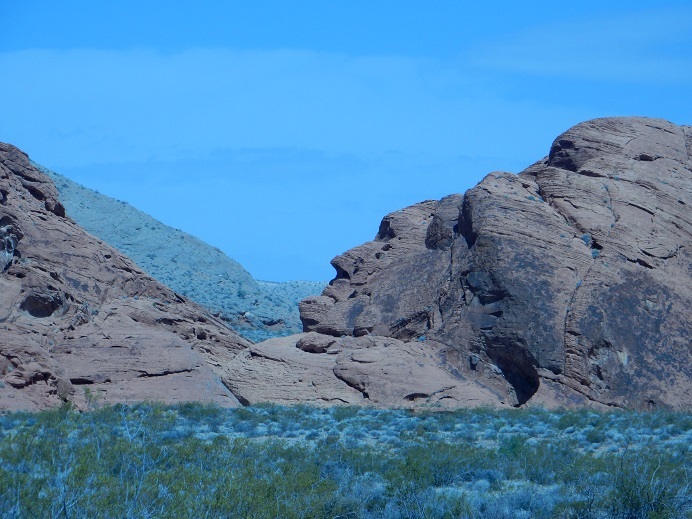 Beth … Nevada has mountains, a desert, a huge city with many attractions – much to see there. Little Lilly … Las Vegas, of course, is best known for “The Strip” which features its casinos and entertainment. Outside of Vegas, you can go to the mountains. My brother took us to lunch at Mt. Charleston Lodge and then we walked in the state park across the street. The area is a wonderful contrast to Vegas’s hot temps – about 20 degrees cooler. Judy that must have been amazing, especially the ancient writings on the rock walls. I have had the pleasure of being in the desert in Sedona, it blew me away, all that red earth and blue, blue sky. One of my precious memories of visiting the USA. Thanks for sharing your adventure. Kath … My husband and I were there for several hours. The tour group was small – six of us and the guide. It was a wonderful trip, gorgeous vistas. My Dad took us out to the desert many years ago and showed us petroglyphs. Very cool! I’m glad you liked the photos. Smaller groups are always better in my opinion Judy, must have been nice to revisit. 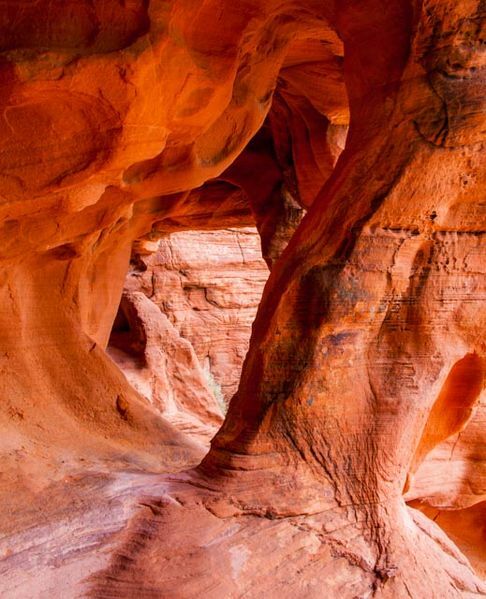 You pictures of Valley of Fire Park are wonderful, Judy. Some of them remind me very much of the Moab, Utah, and when I’m there I’m in awe of the grandeur. While I feel refreshed and renewed by cool, woodsy and lush surroundings, the dessert landscapes offer their own lessons and inspiration. 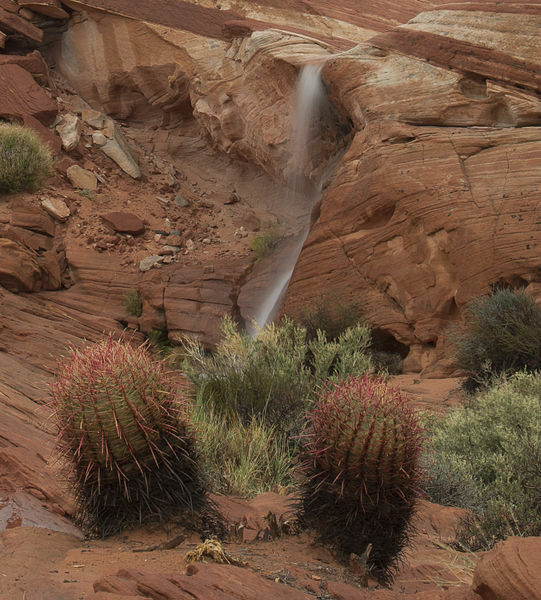 Each setting has its own appeal: the desert, cool woodlands, refreshing waterways. 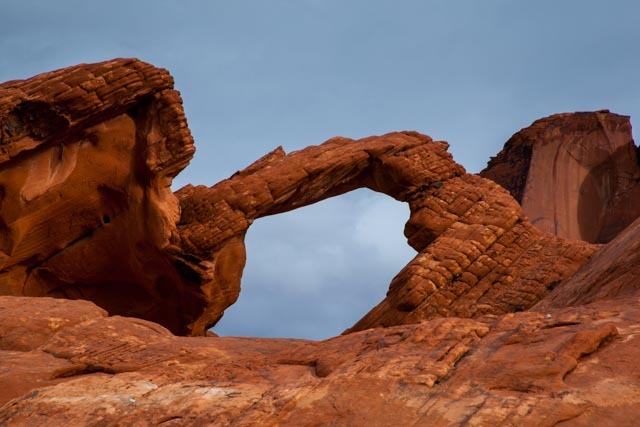 I’ve never been to Utah, but I’m betting it has many sites similar to Nevada, Arizona and California. All beautiful. Reminds me a bit of some of the hiking we did this summer in Utah. I’m thinking you could “fix” your photos in editing software by adjusting the white balance. Amy … The desert is a wild area well worth exploring. Thank you for your suggestions on how to “fix” my photos. That’s a suggestion that disperser made as well. I might do that this weekend. Gorgeous! Nature can be so inspiring! Thanks for the trip to the desert Judy!! 🙂 I grew up watching old western movies with scenes like these (although I believe some of those venues were not in the US) I’ve never seen such a glorious place in real life. I’m not a fan of hot weather conditions (tends to make me feel extremely unwell) the thought of going anywhere near a dessert scares me! But, what an amazing place, and beautifully colourful too. Very glad to hear you had the company of a breeze to keep you a bit cooler! Suzy … The rock’s natural look appears that an Indian Chief was carved into it. I’m sure it looks quite different from another angle.